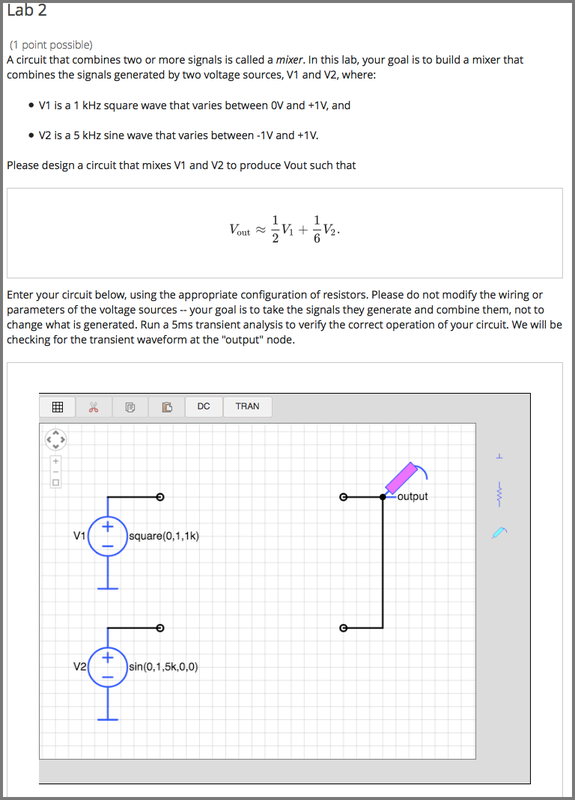 In circuit schematic builder problems, students can arrange circuit elements such as voltage sources, capacitors, resistors, and MOSFETs on an interactive grid. They then submit a DC, AC, or transient analysis of their circuit to the system for grading. In the unit where you want to create the problem, under Add New Component select Problem, and then select Advanced. The illustration above shows a condensed version of an actual problem from MITx’s 6.002.1x. To create the entire problem, paste the following code into the advanced editor. <p>When you're done or if you wish to save your work, please click CHECK. You might have started to design your mixer with two resistors only as the example suggests. But working through the math, soon you'll realize that the equations return no non-zero value for the resistor components. Thus you have to change the design. The next simplest design will be to add a resistor \(R_3\) that connects the node Vout to ground.